With a rating as prestigious as number one in Utah by Zagat, The Mariposa at Deer Valley Resort is a winning selection for dining in Park City. Upon entering, the warm fire instantly thawed the bitter cold I left behind on the other side of the door. We were quickly shown to our table in an intimate room with only a few other tables, alongside another crackling fireplace. As we settled in, the waiter stopped by to give us a rundown of the menu and the ordering process. “People typically choose between three to five courses. I myself do six, but that’s another story,” he joked. We went with four each and a fifth to share. The nori and sesame seared #1 ahi was one of my favorites, and was also what I started with. The lightly seared ahi served with pea shoots, cucumber, avocado, fresh grated wasabi, and soy and ginger sauces was a pleasant surprise for my taste buds. My next choice was a dish that I was instantly drawn to upon opening the menu. Although it’s a simple combination, I am a sucker for any sort of tomato, basil, and cheese concoction. So I knew I would be ordering the burrata, fresh basil, and heirloom cherry tomatoes salad. Despite its simplicity, I’ve experienced quite a few restaurants that just can’t seem to get it right. At The Mariposa at Deer Valley, my taste buds were pleased to discover that the aged balsamic vinegar and extra virgin Arbequina olive oil perfectly complemented the fresh burrata, basil, and cherry tomatoes atop the bed of arugula. I kept expecting for there to be that one dish that disappointed me, but it never came. To be fair, gnocchi is nearly always a win for me, and the lemon thyme gnocchi that arrived next was no exception. Topped off with slow-poached wild gulf shrimp, these soft dumplings were satisfying down to the very last bite. The quail saltimbocca, one of their specialties, was my meat of choice. It translates to “jump in my mouth,” which is an appropriate way to describe the dish. The boneless quail breast is pan roasted and served with house cured prosciutto, creamy miso braised kale and mushrooms, fresh sage leaves, and a cabernet reduction for an “mmm-inducing” sensational meal. Let’s not forget dessert! I did not hesitate to order one of Deer Valley’s famous chocolate snowballs, a semisweet chocolate cake covered in vanilla whipped cream to give it the appearance of a snowball. It’s one of those desserts that is so pretty you almost don’t want to eat it… but give in, and just one bite of the chocolatey goodness is all you need to understand why the dessert is so famous. I am please to say that the Zagat rating of being number one in Utah is well deserved. 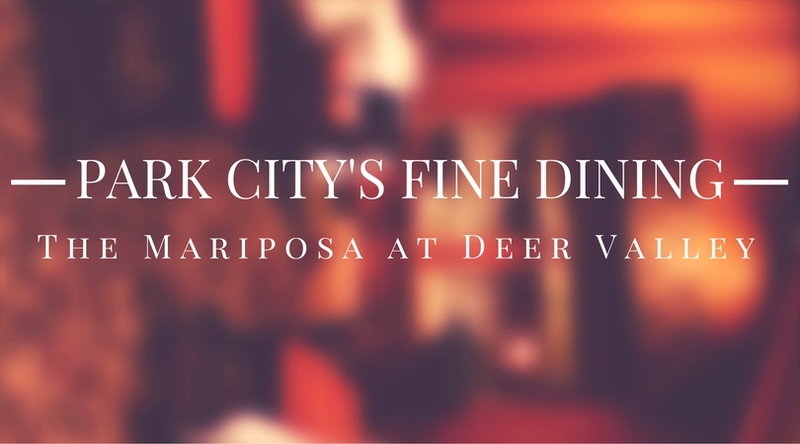 On my next trip to Park City, The Mariposa at Deer Valley will be the first place I go for dinner. Braving the cold high up on the mountain was absolutely worth it for such a memorable and delicious dining experience! While this trip was facilitated by Visit Park City, this did not affect my views and all opinions are my own. Special thanks to Deer Valley and The Mariposa for the impeccable food and service. Two of my favorites: burrata and gnocchi! OMG, I would have LOVED this meal!! No wonder they are rated #1 by Zagat, the presentation alone looks brilliant. Nice to hear you really enjoyed it. Food that tastes and looks beautiful 🙂 Win-win! I am a sucker for the first two courses as well! Anything ahi or tomato/basil! That looks delicious and pasta is perfect for cold weather! Wow, this meal looks like perfection. The tuna sounds amazing, and I love the detail on the dessert. I haven’t been to Park City before but my dad used to have a ski condo there many years ago. Definitely on my wish list! It truly was! You definitely have to make a trip out there, it’s so worth it! That meal looks delightfully awesome! I’ve still never been to Park City and I need to make that a priority.